Armand Roulin (Booth) tries to find out what happened to the late artist Vincent can Gogh (Gulaczyk). 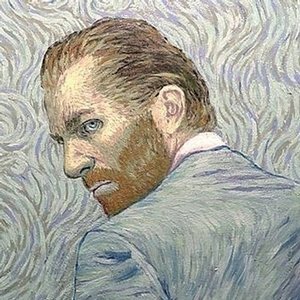 Live action footage was hand-painted over to give a van Gogh-like effect, and the result is visually intoxicating, adding up more than the novelty of its sumptuous parts. On 29th July, 1890, Van Gogh, bullet in his belly, stumbles along the high street of Auvers Sur Oise. Traditionally, the famously troubled artist’s death is viewed as suicide. But this film delves into the ambiguities of his life and last days to reconsider the narrative via the stories of his paintings and the people who inhabit them. Starring Robert Gulacyzk, Saoirse Ronan, Aidan Turner and Helen McCrory, whose performances form the basis of the impressionist animation.